Full Accoyo son of 6Peruvian Accoyo Titan. LEGENDARY'S RECEIVED HIS SECOND GET OF SIRE. LEGENDARY IS PASSING ON HIS INCREDIBLE TRAITS! THERE IS NOTHING LIKE THE FEELING OF KNOWING THE QUALITY YOU ARE GOING TO GET! MFI Peruvian Legendary is an absolutely stunning light fawn male with the most incredible, buttery soft fleece that is a delight to touch. His fleece is awesome...dense with high-frequency, high-amplitude crimp. With his black skin, nails and dark gums, we expect this gorgeous herdsire to throw a wonderful array of colors. 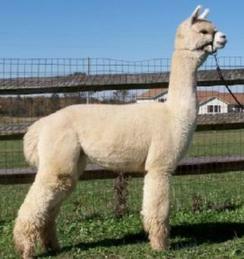 He has a true alpaca phenotype and is one of those males who stops people in their tracks when they see him. His sire is PC Running Late, son of 6Peruvian Accoyo Titan. MFI Peruvian Legendary has a WOW in the genetic lineup: Accoyo 4Peruvian Legacy, Snowmass Millenium, Peruvian Dakotia, Peruvian Hemmingway, Peruvian Bueno and Peruvian Charmingway, 6Peruvian Accoyo Titan. That is enough for any breeder who wants the very best in their herd. We purchased Legendary at the 2008 Breeder's Choice Auction and he was the 2nd highest seller at the auction.